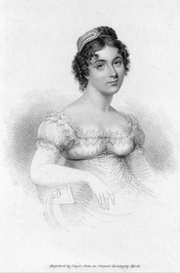 Harriette Wilson was a famous courtesan whose lovers included The Prince Regent (the future George IV) and four future Prime Ministers. Short of funds in middle age, Harriette sold her memoirs after offering to edit out any lovers who would pay her. The Duke of Wellington famously replied, "Publish and be damned!" Harriette Wilson is currently considered a "single author." If one or more works are by a distinct, homonymous authors, go ahead and split the author. Harriette Wilson is composed of 2 names. You can examine and separate out names.